Epos K1 review | What Hi-Fi? The Epos K1 bookshelf speakers are ideal if you’re on a tight budget, have a small listening area and are looking for decent performance. At £400, these compact speakers are a tempting offer. There’s lots we like about the Epos K1s. They sound solid and lively. Detail definition is decent, with enough energy and dynamics to get you snapping your fingers and tapping your feet in time with the music. It’s a smooth, weighty sound that’s a pleasant listen. We like the even tonal balance of the speakers. There are no hard, bright edges to the horns in Quincy Jones’s Blues In The Night. Nor does the bassline in The White Stripes’ Seven Nation Army turn into a woolly, booming monster. The K1s give a performance to match their capabilities – and price range – and while they may not be as transparent, precise or powerful as some class rivals, they deliver an inoffensive sound that’s easy to listen to. On the flip side, they can be overwhelmed by complex arrangements. They don’t quite have the authority and subtlety to fully convey the dramatic, dynamic upheavals in Hans Zimmer’s The Dark Knight soundtrack, and we could do with more nuance and clarity from voices here too. It’s always worth bearing in mind, though, that the K1s cost £400. 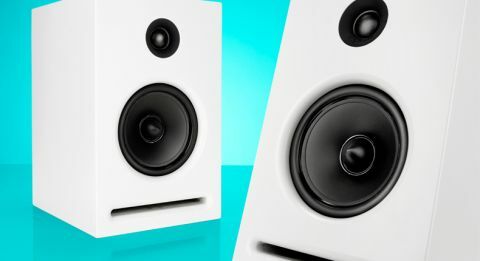 The Award-winning B&W 685 S2s offer more excitement and insight, but they will cost you a hundred quid more. The Cabasse MT32 Antigua speakers (also £500) offer a bigger, wider soundstage, too, but the K1s have a more focused soundfield that’s best suited to smaller rooms – they would be lost in a large listening space. The Epos K1s are simplicity defined. Our review sample’s white finish is startlingly minimal, with no distinct markings or branding on the clear, smooth fascia. The two drivers (a 25mm tweeter and a 15cm mid/bass driver) are similarly plain: all black, with no visible screws or any shiny accents. The minimalist design will appeal to many, while others may find it a touch too stark. Next to the distinctive designs of, say, the Triangle Esprit Titus EZ and B&W 685 S2 speakers, the Epos K1s look rather nondescript. These are nicely made speakers, though: edges are smooth, build quality is sturdy and there’s the option to biwire them. You can also get the K1s in black, while a wood finish will be available later in the year. Magnetic snap-on grilles are also available for £30 per pair. The K1s do have a neat trick up their sleeve: you can transform them into a pair of active speakers. The removable rear baffle (held on with screws) makes it easy to switch the passive crossover for an active alternative (an upgrade Epos will be releasing later this year). Sure, if you shell out an extra £100, you get the astounding B&W 685 S2s. This may seem like a reasonable jump, but for some, £400 is the absolute limit. And the Epos K1s make a convincing case for themselves. They may not be the most exciting speakers out there, but you shouldn’t overlook them.